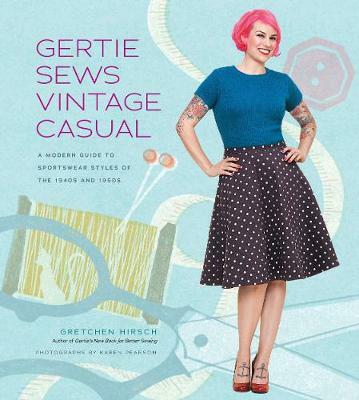 Gertie Sews Vintage Casual is Gretchen Hirsch's follow-up to Gertie's New Book for Better Sewing. In the first book, Hirsch focused on dresses, skirts and evening wear. But the mid-20th century was also an amazing time for sportswear - think wide legged trousers, playful beach rompers, '50s style shorts, casual dresses, fitted capri pants and casual jackets and coats. Gertie Sews Vintage Casual is organised like her first book into two major sections - Techniques and Projects. In the first part, Hirsch focuses on techniques that are specific to sportswear, such as buttonholes, collars, interfacings, pockets for shirts, special considerations when working with knit fabrics and the intricacies of pant-making. The projects are in Part II are designed to work as a complete casual wardrobe.